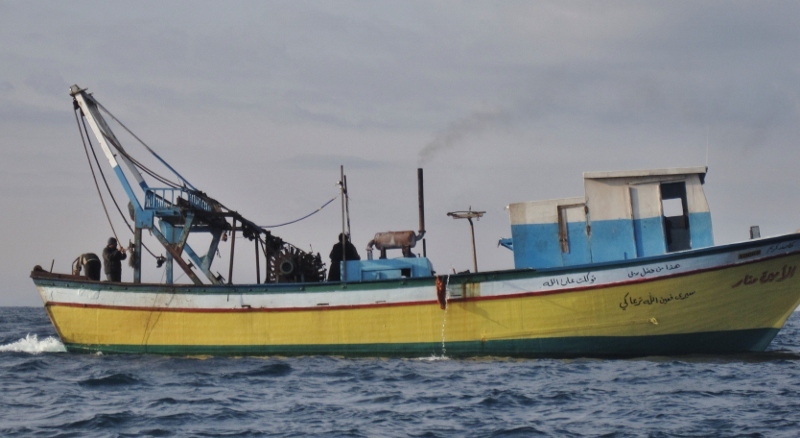 The Israeli navy violently seized two Palestinian trawlers in Gazan waters yesterday, shooting one fisherman in the arm, and ultimately forcing at least ten men to Ashod, Israel, where they were interrogated for several hours. Israel released all of the fishermen at 2 a.m. this morning. Twenty-eight year old Nehad Mohamed Rajab Al-Hesy reported that his boat, along with six others, were fishing in the same area at about 11:30 a.m. Tuesday morning when he suddenly saw five Israeli naval ships—three large and two small—approach his boat, along with that of Omar al Habil. 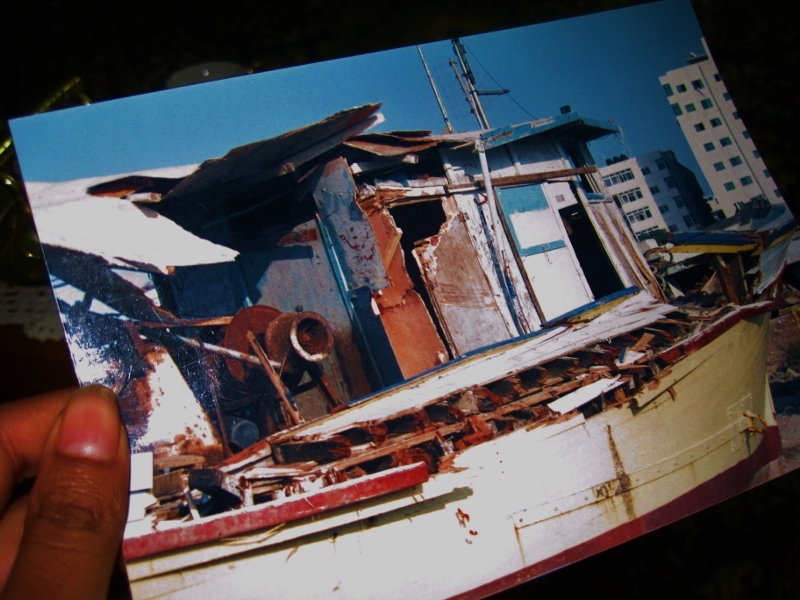 According to Al-Hesy, both men had sued Israel for destroying their boats in the past. “The Israelis told four boats to go back to Gaza. All six boats tried to pull up their nets, but they prevented us. The Israelis started to shoot at us a lot and I got shot in the arm. The bullet entered and went out of my arm,” he added holding out his left arm wrapped in white gauze and bandages. The Israeli navy then asked who was in charge of the boat and Al-Hesy answered that the boat was his. Next, the Israeli navy commanded him to take off his clothes, jump into the sea and swim until he reached the Israeli naval boats, then asked the three others—Mohamed Rajab Mohamed Al-Hesy, 18, Jarrimal Jehad Rajab Al-Hesy, 22 and Mohamed Jehad Rajab Al-Hesy, 19—to do the same. In Ashod, Israeli forces began questioning Al-Hesy at 5 p.m. The soldier subsequently changed the subject of the interrogation, asking Al-Hesy the names of the policemen working at the port. When the interrogation finished, Al-Hesy was told that he would be sent back to Gaza, but he refused to go without his boat. When Al-Hesy saw the other fishermen he told them he wouldn’t go back to Gaza without his boat. The other fishermen agreed to do the same and refused to get on the bus to the Eretz border crossing. Israeli forces eventually forced all the fishermen on the bus. Al-Hesy and the other men were eventually released at 2 a.m., but his trawler, along with that of Omar al Habil, remains in Israeli custody. Al-Hesy has been fishing since he was 13 and makes about 20 shekels a day, or $5.70. He recalls making 1000 shekels ($285) when Israel permitted fishing up to 20 miles. 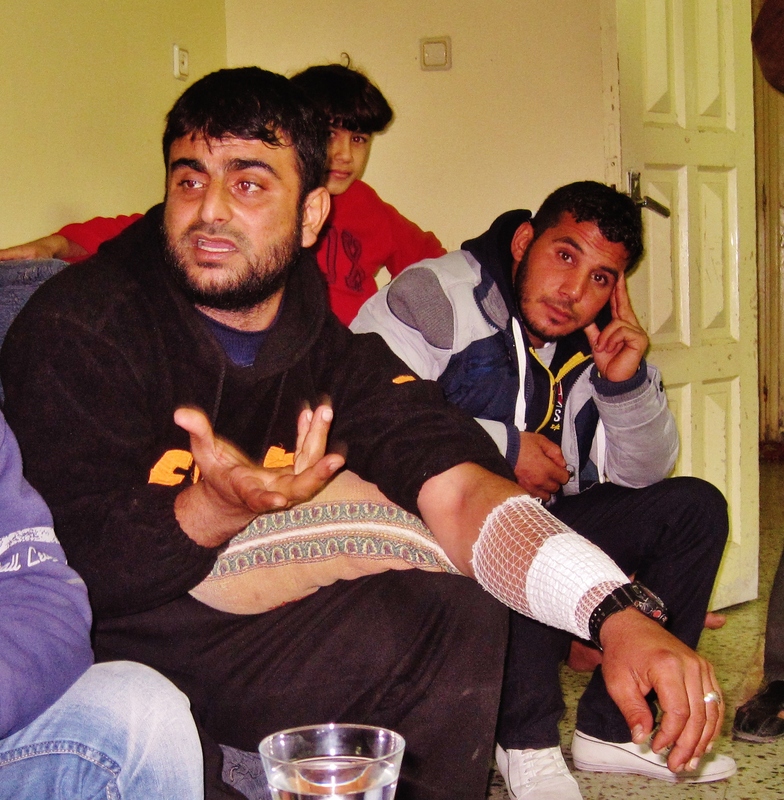 In addition to sustaining a bullet wound to the army, Al-Hesy also had scabs around his right ankle from the ankle cuffs. His lawsuit stems from an incident in 2007 when the Israeli navy destroyed another boat of his. That case is still ongoing. This entry was posted in Fishermen, Prisoners by notesfrombehindtheblockade. Bookmark the permalink. Read about you from our free gaza discussion group about you and Huwaida getting deported from Bahrain.I noticed you are originally from Newport Beach, I went to high school there and now have a home in Laguna Beach. I originally am from Los Angeles. For the last two years I have spent my Spring months in Gaza, teaching at Al Azhar University and doing research for Gaza Community Mental Health Programme. Having received my PhD from University of Southern California in international, intercultural and urban education with a specialization in Arab American and Muslim American Studies, I do not have a regular professorial appointment–taught one semester at USC in American Studies and Ethnicity, so I volunteer my services in Gaza. Last Spring I was there during one of Israel’s escalations and as you describe, it is not too pleasant in Gaza. Before I went to Gaza in Spring 2011 I was in Egypt during the start of the Revolution and also went to Lebanon before entering into Gaza. My paternal side is from Lebanon and so my whole life has been entrenched in the Middle East with having a relative in diplomatic service in Lebanon so I am familiar with the imperialistic/tribal politics so to speak. If you want to communicate, my email is dianeshammas@yahoo.com. Glad to see you and Huwaida are home safe. As a sidenote. After returning from Gaza the last time, I hear helicopters over here in Laguna Beach coming from the military base in San Clemente. I first freaked out thinking of the drones buzzing sunana in concert with the Apache helicopters in Gaza but learned to cope. I have a friend who survived the Lebanese Civil War, Fourth of July and the fireworks are a frightening thing for her.